Is the concept of account-based marketing (ABM) really new, or is it just the latest industry buzz-phrase? Coming off of this year’s marketing tradeshow season, it seems as if EVERYONE has jumped on the messaging bandwagon claiming to support your ABM strategy: predictive analytics companies, list and data vendors, all the display ad/retargeting tech players — a myriad of MarTech tool providers. So peeling the onion back, what is ABM really? The fact is that account-based marketing as a concept is nothing really new, but because of recently emerging tools and technologies that can help marketing organization to support it as a strategy, ABM is well on its way to becoming a mainstream marketing approach that is feasible for every B2B company — not just those who were perhaps focused on very niche markets or had the deal sizes tied to large enterprise sales which warranted greater marketing investment. In years past, we’ve used terms like “integrated marketing,” “multi-channel marketing,” and “sales-based marketing” to describe what were often somewhat similar approaches that involved proactively identifying and targeting buyers with high-impact campaigns. For instance, we could leverage direct mail and telemarketing while (theoretically) hitting the same audience with display ads and digital marketing. Handpicking a small number of top sales target accounts for premium response gift offers delivered via multi-touch email and dimensional mailers with rounds of follow up calls was an effective strategy as well. At the same time, organic banner advertising, content syndication, and other online marketing programs could offer some supporting “air cover.” We’d see good — often outstanding — response rates, but the effort in coordination and associated costs for these campaigns were enormous. And in many cases, we couldn’t get detailed data to help us improve program effectiveness. A fresh new flavor (or maybe flavors!) of account-based marketing has been enabled by the ongoing convergence of modern marketing tactics and technology with good old-fashioned, multi-touch, sales-based marketing. It’s all about focusing your marketing on the buyers you want, and being keenly relevant in your message, while also having the ability to orchestrate and measure your efforts like never before. New platforms and tools, like DemandBase and Terminus, give us the ability to reach buyers in narrow segments and even in specific accounts with display ads and retargeting those same individuals. Others can help us to “geo-fence” our digital marketing efforts by design. Engagio, which integrates with Salesforce, can measure engagement with your sales team’s target account lists via marketing channels: which accounts are visiting our website? Responding to our campaigns? Are our SDR/telemarketing teams connecting with them? That all sounds great, of course, but let’s spend some time on the why and how behind implementing ABM strategy and technologies. 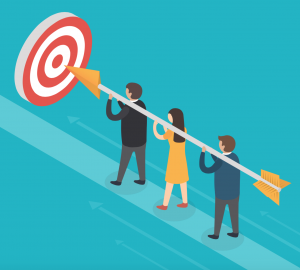 The value of account-based marketing (ABM) is that it gets you to your target buyer and arguably does so with the highest return on investment of any marketing approach. The challenge of it is that you have to build the right strategy and tactics around it. If you do it wrong, not only do you miss your targets and increase marketing’s “wasteline,” but you can also damage that critical trust and alignment between sales and marketing. As much as you can, get sales to put skin in the game. Have them take ownership of accounts to be targeted by providing or vetting lists, and solicit their feedback on accounts marketing brings to the party. When marketing runs an account-based campaign and garners response, sales will be to be getting leads and meetings with exactly the companies they wanted. This is a great way to gain major points with sales! On the other hand, running the greatest ABM campaign to an untested/unproven account list is a roll of the dice — come up snake eyes, deliver few qualified leads (or funky ones), and you’ll quickly erode sales’ confidence in marketing. Strategy. The strategy for ABM success is made up of sales involvement and accurate data. Getting started with ABM first requires working with sales to carve out and identify specific accounts. Sales also have great insight into companies in their territories, where they did research already and know the companies that fit the mold of a good customer. After that, you’ve got to have accurate data: it’s critical to validate that you have correct company firmographic info as well as up to date contact information. For example, don’t forget that even in the digital age, to reach individuals you actually need a mailing address to which you can ship physical things. For instance, you really don’t want to send a high-value premium gift offer to the corporate mailroom; make sure to obtain the address where the C-level executive can actually receive a FedEx package. There are many great ways to vet the accuracy of data via third-party sources and telemarketing that are well worth the time and expense. Orchestration. The ABM process involves a lot of moving pieces to coordinate, as a marketer: the account lists, the contact data, campaign channels, sequence and timing of touchpoints. How you are going to support this orchestration factors into the success of this type of multi-touch campaign, so choosing the right technologies to make this complex coordination much more manageable will be very important. Marketing Automation will be the hub of your ABM tech stack, so start there if you haven’t adopted a platform yet. Do your homework! There’s A LOT of tech out there for marketers to buy, so leverage your networks and the community to invest in proven solutions. Measurement. A big advantage of the surge we’re seeing in MarTech that plays into ABM nicely is that we can measure things marketing couldn’t measure before. We now have reporting technologies integrated with MA and CRM, showing the effectiveness of our efforts. Early on in a campaign you can see if targets are hitting landing pages, visiting websites, and engaging with email campaigns but in a well orchestrated ABM campaign you will ALSO be able to see if they are connecting with inside sales or telemarketing resources, taking meetings, turning into qualified leads, and moving to the pipeline and revenue. With solutions like DemandGen’s Campaign Attribution Analyzer, now you can link marketing activities to pipeline and revenue all the way through the buyer’s journey from the first glimpse of a display ad. You can measure and adjust campaign strategy and tactics, and be able to clearly show campaign attribution. Yes, it’s a lot to do. Wow, that’s quite a bit to digest – and ABM shouldn’t be an endeavor your marketing team pursues alone or with too limited of an investment. Here at DemandGen, we spend every day helping companies optimize their systems and process infrastructures to, among other things, enable the execution, orchestration, and measurement of ABM strategies. Which tools and technologies will play well together, and how do you stitch together the right mix? If you’re struggling with how to leverage your current marketing automation system, other MarTech apps, or reporting mechanisms to support ABM, call on us for help.